Inspiration / Books / It’s Here: Field Guide No. 9: Revolution! The great season for knitters is here, the climate we love best: sweater weather. How sweet is the sound of those two words. Indoor sweaters and outdoor sweaters. Sweaters every day. Sweaters every night. Big sweaters and baby sweaters, and, heaven help us: dog sweaters. Like the Whos of Whoville, we believe that everyone should have a big, bold, beautiful sweater for every occasion. Knowing that we’d be publishing our ninth Mason-Dixon Knitting Field Guide into the sweet start of sweater weather, we looked for a designer who could deliver the goods: sweaters that would be a delightful adventure to knit, and result in sumptuous garments that we will wear forever, whenever it’s sweater weather. We asked a designer who is known for her blazing brilliance and spirit of adventure as well as her classic, wearable garments. Who else but Norah Gaughan. 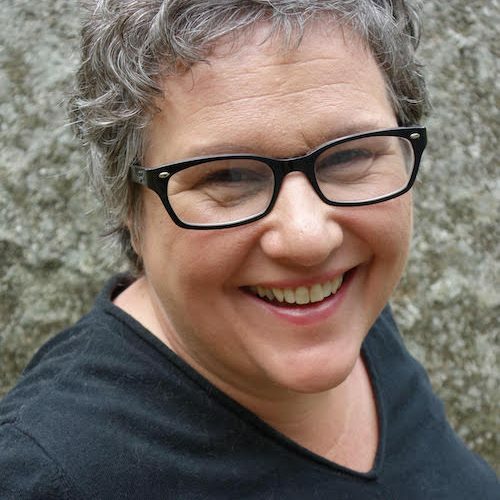 For more than 30 years, Norah Gaughan has set our minds awhirl. She is a true revolutionary—a genius of construction, a master of cables, and a fearless innovator. The four designs she has given to this Field Guide are an extraordinary chance to play in her world. Let’s take a peek at the projects of Mason-Dixon Knitting Field Guide No. 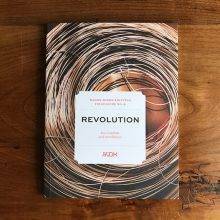 9: Revolution. The four yarns here make the most of these juicy cables. 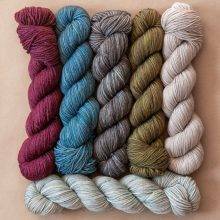 As a special treat, we worked with Karin Maag-Tanchak of Periwinkle Sheep to develop a palette of nine subtle shades available only here at MDK. Part of the fun of knitting cables is their endless variability. Each one strikes each of us differently. 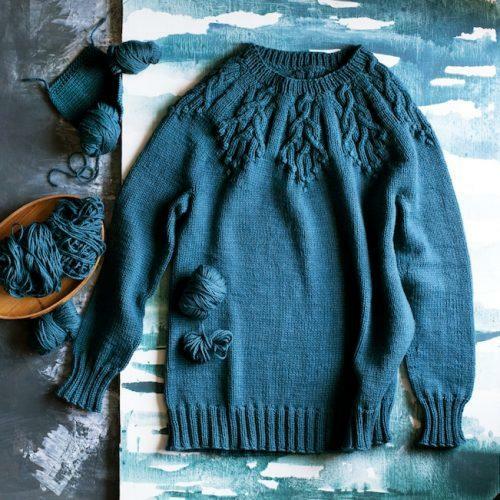 Sometimes we want this garment with that cable, or the cable from one garment shape, but on another style of pullover, or cardigan, or capelet. Norah thinks about cables all the time. Her mind is a generator of new cable patterns, ranging beyond the familiar realm of traditional motifs. Coordinating with the launch of Field Guide No. 9, Norah is launching another brand-new collection of cabled designs. It’s called Interchange (ability), and it’s delightful. The collection includes four more cables to play with, each very different from the cables in Field Guide No. 9, and applied to four different garments. But guess what! All the cables in Field Guide No. 9 are interchangeable with the cables in Interchange (ability). It’s a menu of delicious options for both the cable motif and the garment shape that you want to knit. 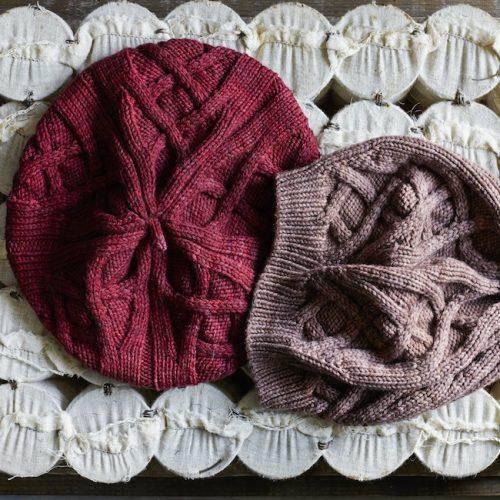 We could knit from these two collections forever, happily swapping cables and shapes. This is where the fun is. Please join Norah, and us, on this grand adventure, and let’s all have a fantastic season of sweater knitting. More fun to come! Whee! Field Guide No. 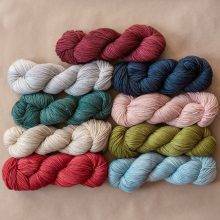 9: four fresh projects paired with four yarns that are perfect for cables, and for sweater weather. I’m already in love with this!! Wow, very nice! I especially like the first little short-sleeved one. I think that’s the first one for me but I’m dithering….sleeves or no sleeves? I’m not a vest person, but Calligraphy is not a vest. DECISIONS. I will dither more and cast on the beret. IbwanI to purchase the yarn and the field guide at the same time so I can start the Calligraphy asap. 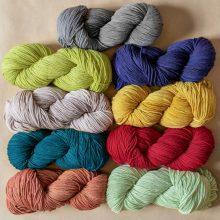 How many skeins of yarn does it take for a women’s 10 or a medium? Already saved Swirl Topper in my favorites! SO GOOD. I love everything. Everything! As I read about each pattern, my eyes got wider and wider! WOW! Cannot wait to pick up my issue! Ann and Kay, last night I was thinking briefly before falling asleep about how the two of you met online in the chat room about knitting. It occurred to me how seemingly small events like that come to be, and how they end up changing our lives forever. So I reflected on the first days when I read Mason-Dixon Knitting, the wonderful writing about knitting, about crafts, about our lives, and how standing on that basis you guys have reached out and touched so many aspects of another’s life, of a person’s life, exponentially. How we knit, how we take care of ourselves, how we take care of each other in our communities, cooking, television, radio, bringing us designers, coaches, beautiful yarn, cooks, etc, that spark inspiration in our lives.The books, the field guides, the ballband dishcloth! When I attended the first knitters retreat in June it was so special, not just because of what was presented to us, not simply the fact that we were all knitters, but we were a group of people who have shared all of the experiences throughout the years on MDK. In a bunch of strangers it was like being with family. When I drove up that afternoon and registration was already going on outdoors and I caught a glimpse of Ann at the registration table as I drove by, my eyes started to tear because in some someway I was coming home. I can’t put into words all the things that I’d like to say; there are so many nuances. It is just so remarkable how things in life happen, how you turn a corner never knowing is going to change your life forever, and I think that’s what’s happened when the two of you met in that chat room. In changing your lives with a new friendship our lives have all been enriched as well. And now we come to Field Guide number 9 which is not simply Field Guide number 9 but also interchangeable with another set of the designer’s work. How amazing is that! Oh Diane, how good to hear from you. I think about these things often. Somewhere along the way we made up an MDK Rule: At least once in your life, write to somebody you don’t know. That’s kind of the core of the whole thing, I guess. You never know what might come of it! Yes, yes, yes, all the little ripples that Ann and Kay send out into the world that subtly enrich our lives. Perfectly expressed, Diane. How beautifully expressed. I, too, am grateful for that pebble dropped in the pond whose ripples have touched so many of us and enriched our lives. It is wonderful that you have expressed your thanks and appreciation for what Kay and Ann have brought to all our lives. Not enough of that going on these days, I’m reminded of the saying “No act of kindness is ever wasted”. Knitting for charity is the best. 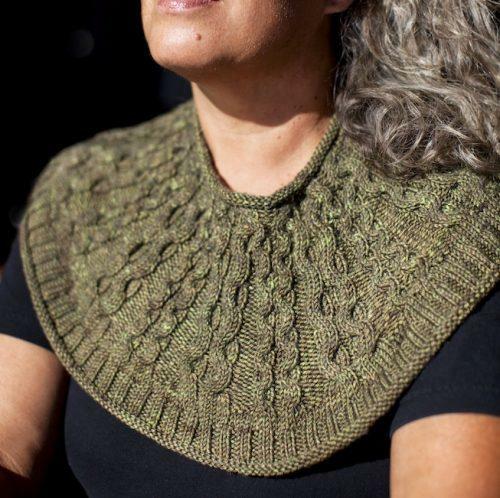 Here is our pattern page, which includes free patterns, and of course there are many on Ravelry. Mountains of them! A grand slam for Norah Gaughan – wait, make that TWO grand slams! She likes to keep busy! Thank you, Sheilah, that means a lot. I actually squealed out loud this morning when I got my first look at these patterns! I’ve been anticipating them since you announced NORAH was coming, and it was the first thing I looked for this morning. THEY ARE FABULOUS! So much yummy cabley goodness… and top down! And bobbles! And all interchangeable! My knitting heart is so full! I had to rush off to work and though I have tried to concentrate on my job, these designs have been floating through my thoughts all day. I need to make all of them. I need to quit my job and knit full time. Whoopee! Three of my favorite knitters collaborating! Before (I humbly confess) I was ever aware of the individual designers in my Vogue Knitting mags, I’d knit a few sweaters by Norah. Many more followed with knot and deliberation. 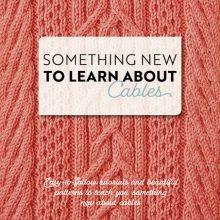 While I still have two sweaters from Norah’s recent cable book on my must-knit list, I’m all in for Field Guide #9. Anything worth doing is worth doing to excess. Been away from home and stash for three weeks now, and haven’t bought any yarn. Saving my purchases for a last three days in London. Norah, MDK and Rowan. What could be better? 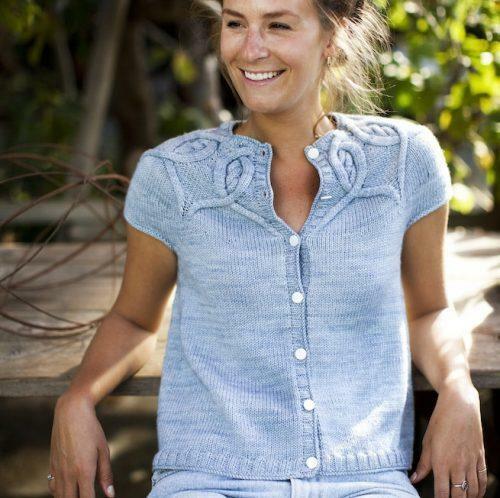 Love Nora, love the sweet cardigan! Have to have it…..
Ooh, my sweater plans may be changing……. Except that this has just completely cheered me up and taken me out of a world of pressure, stress and deadlines we won’t bebe ab to meet into the amazing world of MDK-Norah-cable beauty! Thank heavens for all of you – I want to knit everything! Wow, I am obsessed with these patterns! Already bought yarn and planning to cast on the beret and the capelet. The capelet has me very excited – it almost seems like armor. Such cool designs! This is my favorite Field Guide yet! 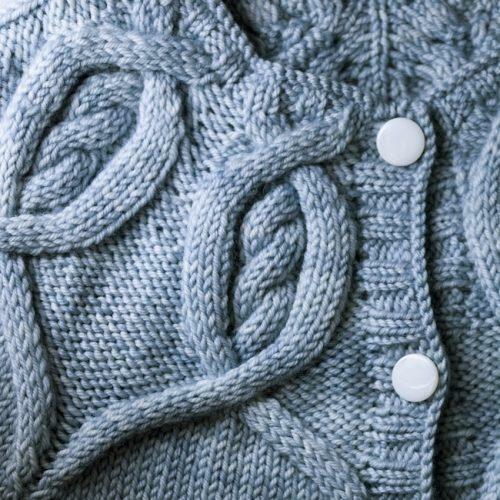 I love that the cables can be interchanged – and Nora’s second collection just doubles that! I love the short sleeve version. The color of the long sleeve version made me think it was going to be knitted in denim. So now I want to knit the short sleeve version in denim! Before I buy Field Guide, I’d like to know the specs of the sweater patterns. I’m a plus size lady and am tired of trying to alter patterns. Altering patterns is a challenge! We put all the pattern specs on the Ravelry pages for each of the patterns. Here’s a link to the Ravelry page for the Field Guide, which has all of the patterns, just click through to each pattern to see the sizes and measurements, etc. This is the case for all of the Field Guide patterns, by the way. 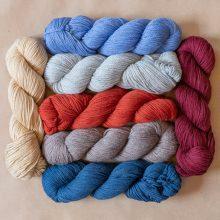 Three cheers for Ravelry and their wonderfully detailed database. I can’t find a way to purchase field guide 9. Where is the order form on your web site?